It was a manic few weeks in the run up to the Galway Races this year. However much you plan your outfit for the day it always comes together at the last minute!! This year for the first time in over 15 years I didn't attend ladies day!! Attending the races is brilliant but when your working right up until the Wednesday night late, you can only do so much. I was certainly there in spirit with lots of beautiful ladies wearing my hats. I attended the races on Friday and also a number of events during the week so I didn't miss out. I love sharing some of the looks from my customers for Ladies Day. 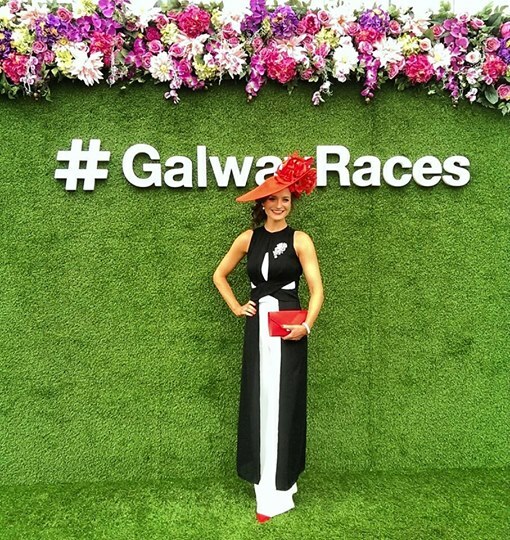 The biggest Ladies Day Competition in Ireland sponsored by The g Hotel Galway. Ladies wear hats every day now to the festival but I wanted to do a showcase for Ladies Day because there was such a variety of styles and hats on display. I love to see the complete look head to toe so here are a few for you to enjoy. Fiona Glynn - Fit and Fabulous - wearing one of my new designs which I tweaked to work with the detail on her dress, love her green bag! Lorraine was the lucky winner of the Clarenbridge Oyster Pearl this year and as a result I sponsored her hat for Ladies Day, I styled her lemon dress with a Navy and Lemon Silk Hat, Shoes and Royal Bag from my studio collection. I love butterflies and designing this stunning silk hat for Caroline Glancy I used the colours from the butterflies on the coat to create a splash of colour with a Bespoke silk Suzie Mahony Designs Hat. Her outfit is from Olivia Danielle Athlone. Orange is one of the best colours on Dearbhla Silke from Catwalk Modelling Agency, I ignored her height with this hat because it is Ladies Day!! Think she looks amazing. Tara Moran and the Team from Maximum Media got all their hats from my studio this year. Tara is wearing a red Suzie Wave hat. Rosanna Davison wearing a soft Gold Headpiece I designed to complement her look for Ladies Day. Judy Fitzgerald looking radiant in blue with a white Percher I designed with loads of height using wired feathers, flowers and silk swirls. 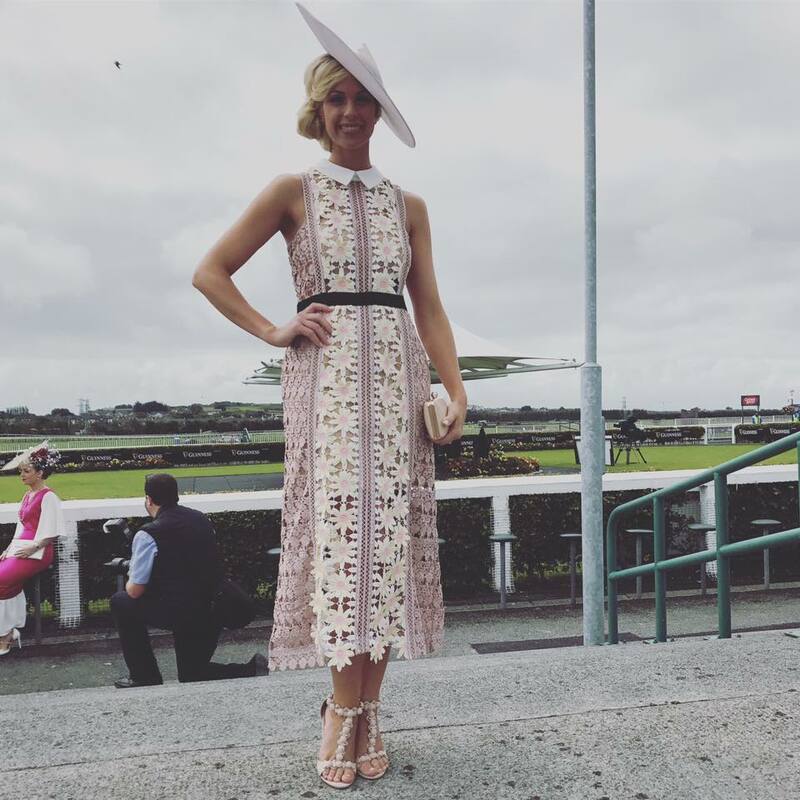 I have had so many complements about this look on Katie Geoghegan who was chosen by Bairbre Power as a finalist for the Best Dressed Competition. I introduced this striking red angular hat because red is fabulous on Katie with her dress from Harper. So delighted for her. Eileen Lundon - Olympic Saddlery - wearing Suzie Mahony Designs for Ladies Day. Aoife's hat is a bespoke Red trimmed with lots of flowers and silk swirls. 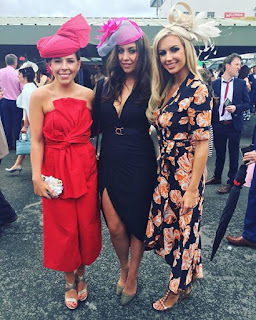 Ladies attending Ladies Day are a very important part of the attraction and atmosphere and indeed the style for the overall week at Galway. I love the addition of the selfie wall this year, maybe we need another one near the Fashion Action!! Susan Flanagan wearing all Ivory Phoenix_V Dress with an accent of Gold. Her hat is embellished with ivory roses and gold silk swirls. Her LIPS gold clutch is also from my studio collection. 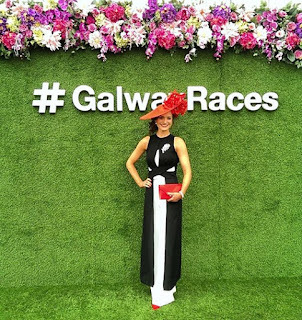 Susan was also chosen as a finalist at the Galway Races Best Dressed Dressed Competition. There is so much effort and planning for ladies for the day it is such a shame we only see a few chosen or highlighted. Social Media is probably the best forum to catch a glimpse of the style, wouldn't be great to see more of our Racing Ladies on the TV, a little balance like they achieve at other race meetings around the world. I was delighted to have customers picked for Best Dressed, designing hats for race meetings throughout Ireland and further afield for the past 15 years, it's still the one closest to home that is the sweetest!! Galway. The showcase of Millinery at the Galway Races puts us on the International Stage when it comes to quality bespoke designs. Looking forward to seeing even more as the racecourse continues its development for 2018. Exciting times ahead! !